There are times when you might need to take part of one image and layer in another image. For the #rangerme meme project in the CLMOOC, we had a template where participants needed to layer in their own image to create themselves as honorary park rangers. Photoshop users can do this easily but many of us are not photoshopping experts. Another easier way to do this task is to use PicMonkey, a free online photo editing site. By uploading a template, and then using the erase/layer tool, you can easily place a second image on top of the first. PicMonkey allows for you to download and/or share the final version. 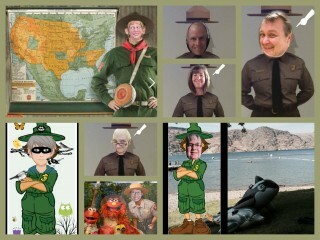 Okay took Kevin H.'s challenge to #rangerme I used http://faceonface.net/en/ and searched for park ranger. It took several rounds to find this one. Upload was easy- and I just used the snipping tool to take a pic once it was done. This work by Kevin Hodgson is licensed under a Creative Commons Attribution 4.0 International License.